With warmer weather fast approaching, it's time we not only changed up our wardrobes but also our skincare routine - ditch the heavy duty creams to help protect dry skin from cold weather and winds, and switch it up for a lighter cream which will help your skin stay bright and breathing through the day. I turned to my friends at Antipodes to find the best cream for warmer days - I currently use Antipodes as a large part of my skincare routine: from my cleanser, to day and night creams, oils, and serums. 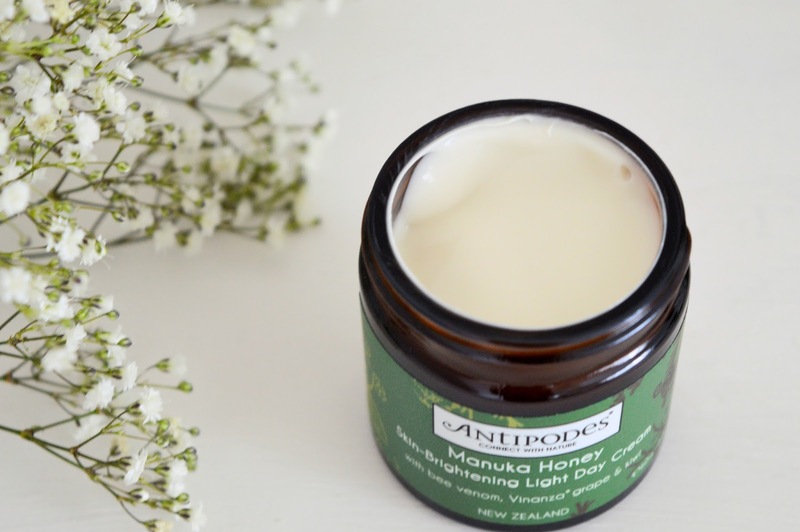 I have been a fan of Antipodes products for years because the use 100% natural ingredients with 70-95% of those ingredients grown organically, and if they're not organic they are strictly governed for ethical purposes. 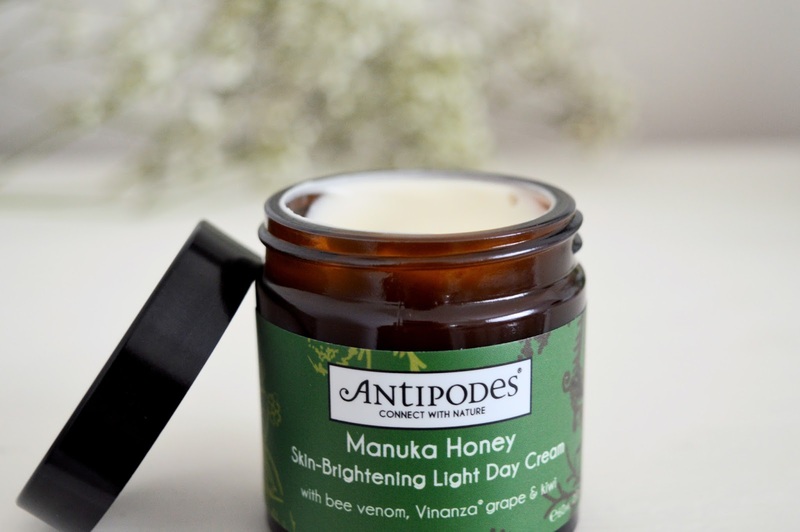 The Antipodes Manuka Honey Skin-Brightening Light Day Cream was the perfect replacement for my winter day cream - a lighter alternative which helps keep my skin nourished, yet I don't feel like I'm wearing a heavy cream. This Manuka Honey day dream helps keep skin looking youthful and bright, reduces blemishes, and evens the skin tone - and I notice results when I use the cream for a week. I can imagine this cream would be especially great for those living in the city - pollution really damages the appearance of our skin, late working hours and cocktail nights make our skin look dull and tired. 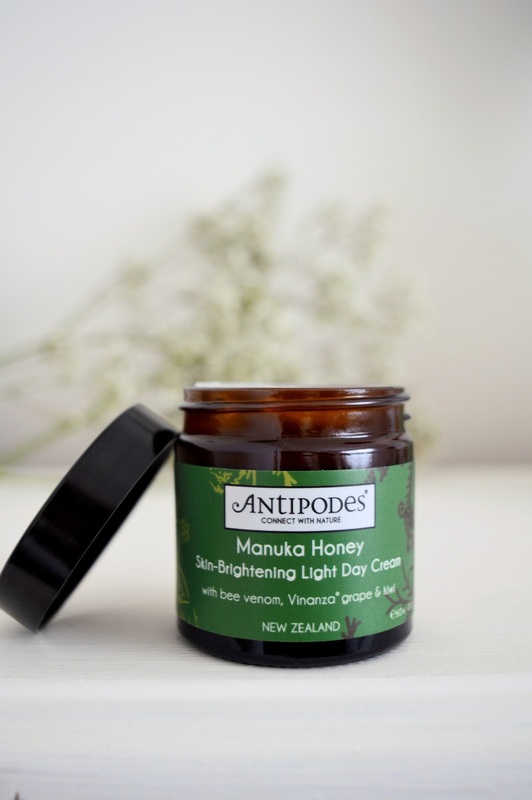 The main ingredients include Bee Venom and Mumaku Black Fern which offer a gentle lifting effect helping skin look younger; Manuka Honey which tackles blemishes; Grape Seeds, Kiwi, and Peony Flower all help keep your skin looking bright and healthy. Plus the moisturiser smells so good! It has an earthy sweet smell which I love. This cream is my go to for spring and summer - I'm hoping that it will help me gain the skin confidence I need to go makeup less during the summer months because at the moment I get really upset about blemishes and my uneven skin tone. I'll keep you guys updated on how it goes! It's funny you're using this cream for the summer. I just finished it - it was my winter moisturizer! For me this was a cream that applied heavy but sank into my skin very quickly, and to me that makes for a winter product. It's probably because we live in different climates - the summer here can be so oppressive, you feel like you're cooking alive - so I didn't even consider opening a new jar now that it's so much warmer. I do have to confess that while my new (summer) cream feels so much cooler I do find that Antipodes kept my skin moisturized through to the evening, much longer than my new cream manages to. Antipodes clearly rules!